wouahhhhh !! just... PERFECT ! beautiful ! OMG Woo you are a true artist! Holy shazam, that is amazing!! 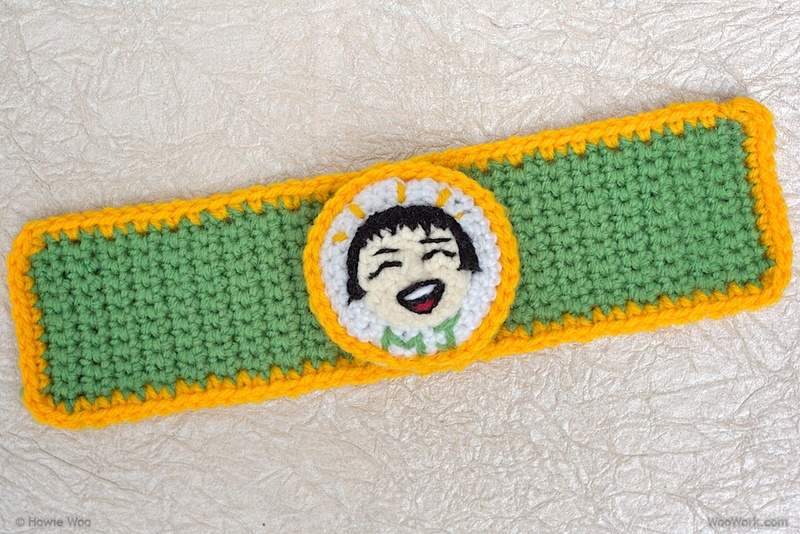 I need to stitch a power bracelet for myself and my friends, too! Shan't look as awesome as yours, but damn, what fabulous gift!! You inspire me to make more beautiful things for the ones I love! Happy Birthday MJ! Howie, as usual your creativity amazes me. I've got to get some of that glow in the dark yarn... got a grandbaby coming and I just know I'll get some ideas. But does it deflect bullets? Happy Belated Birthday MJ! 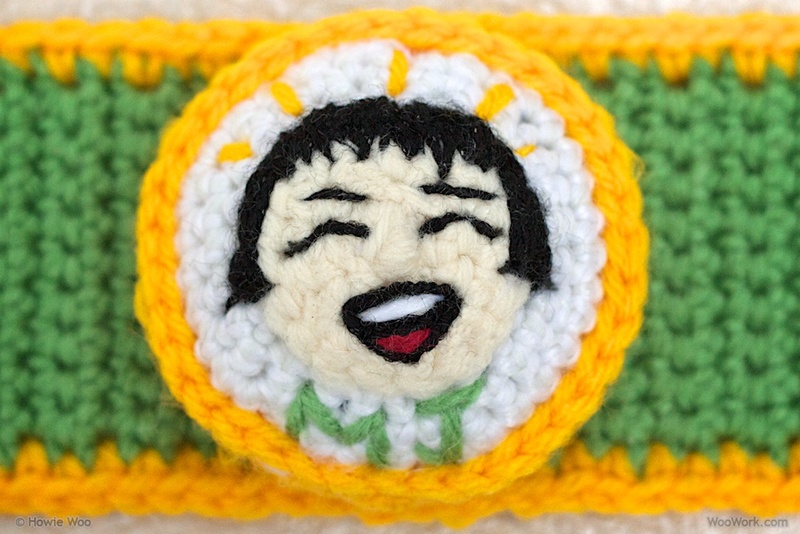 Now that you have your own power bracelet, you can keep up with Howie's carrot jet-pack! Y'all are so feakin' CUTE together and MJ seems so sweet, pretty & happy! LOVE the thoughtful gift you made for her. Y'all are super awesome!! @JelliDonut: I love your donut stamp of approval :) i'm eating a cinnamon one right now! 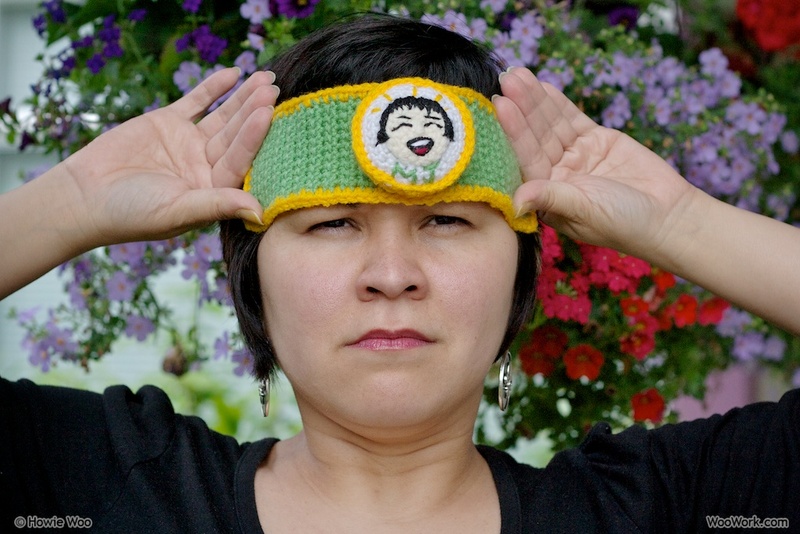 @Karen: Oh yes, everyone should have more power bands… If only they gave us real superpowers! The glow-in-the-dark yarn is from Bernat… I spot that yarn in the stores during Hallowe'en! @PaisleyJade: Thanks for the bday wishes :)) Even though MJ often says she's gettin' old, I think she gets younger & younger-at-heart each year! @oils: I'd like to see your Holy Shazam Bracelet! :) Thunder & lightning powers! @breakmydreams: Thanks for the kind words&wishes! 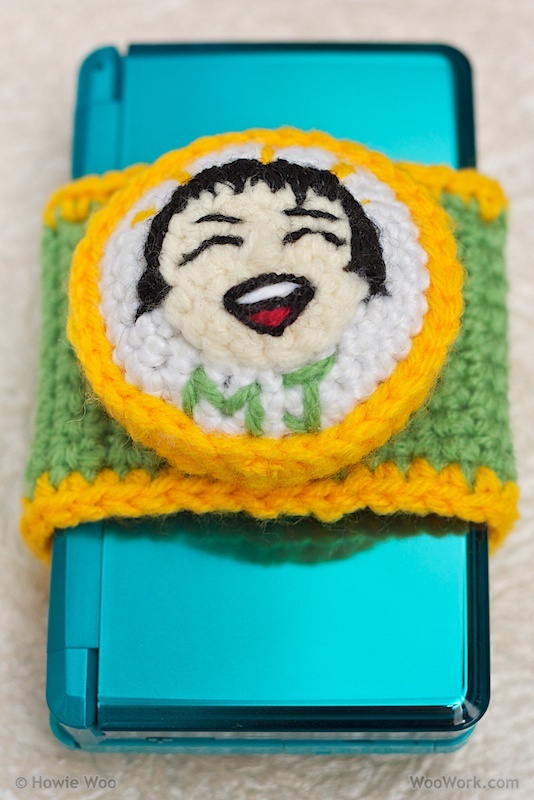 @Karp Styles Crochet and Knitting: Yes, the 3D camera has been one of the best features of the 3DS! We just took some delicious 3D photos at the bakery today. MJ uses the 3Dporch.com website, where the pix can be viewed both in 3D (using the 3DS) or with that wiggle effect (for websites). Wonderful , and stylish. It is really amazing gift. I love its color too. 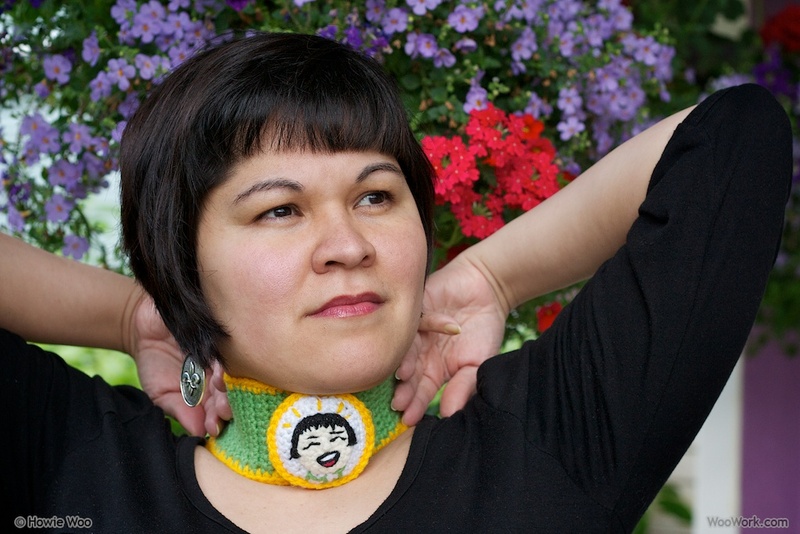 I JUST got my "crochet today" and found the article about YOU!! Congratulations!!! 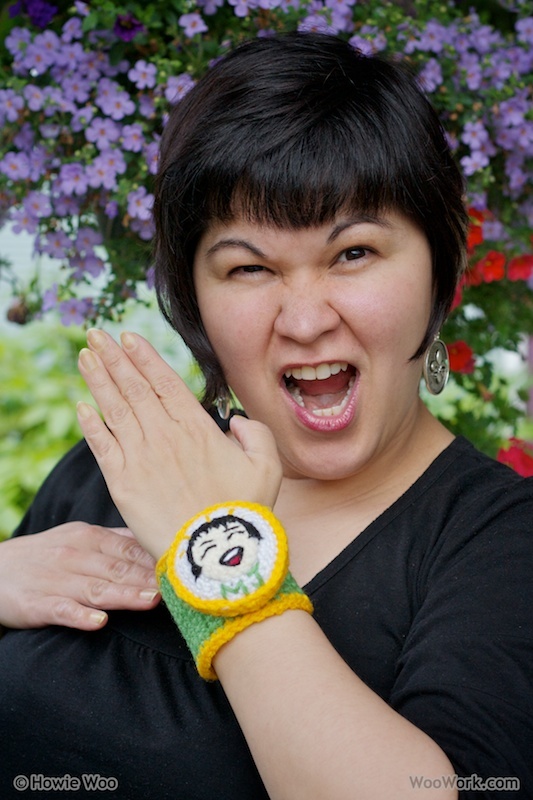 I'm off to check out the rest of your blog :) and... the power bracelet is awesome!! Howie !!! You changed your hair color ! Love green ! You're so gifted, I'm amazed ! And the present's idea is so cool ! Congrats ! I've been reading your blog for quite some time because you're awesome, But I have to admit, the more I read about MJ the more I love her! She's fantastic. Can we all be friends? @Lily: Thanks, Lily :) The bracelet is now resting on MJ's fireplace mantle, safe & sound for now! 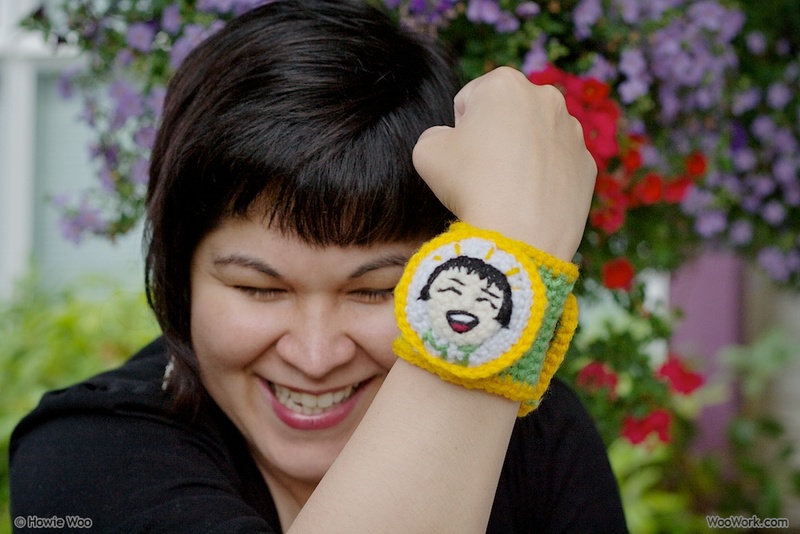 @chinamommy: It was a treat to be mentioned in the Sept/Oct issue of Crochet Today!, and I'm grateful that you visited the blog here :) More nuttiness to follow!